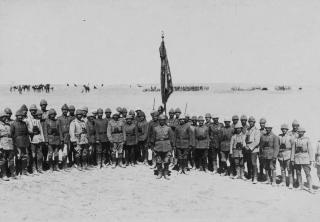 The 53rd Welsh Division join soldiers from across the Empire in the First Battle of Gaza in Palestine. The Welsh take charge of attacking a piece of high ground. They succeed after a bitter struggle against Ottoman defenders. However the battle becomes confused and the 53rd mistakenly believe they are told to withdraw. Of 4,000 killed or wounded in the battle, three quarters are from the 53rd.